My name is Francini. I am 12 years old, and I live in in Costa Rica. I usually get up at 6 a.m. I eat breakfast and, later in the morning, I help my mother with the house chores, especially sweeping and washing dishes. Right now, I am in fifth grade, and my favorite subject is mathematics. I usually leave for school around noon. I walk for about 10 minutes to get to school. It is not far. I have received some cards and letters from my sponsors, having them brings happiness and joy to my life, I am very happy to be sponsored by them and CFCA. If my sponsors were here I would offer them my gratitude for everything that they have done and given me. They are very special. Have you ever wondered about the letters you receive from your friend? 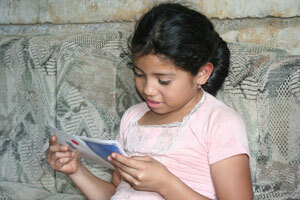 Read Dani Pollock’s blog post about the letter-writing process in Honduras where she is serving as a CFCA volunteer. You can also learn more about Francini’s home life by visiting walk2gether.org.